Elephant Sanctuary Tour near hartebeestpoortdam. Visit the well known Elephant Sanctuary Tour near Hartebeestpoortdam. 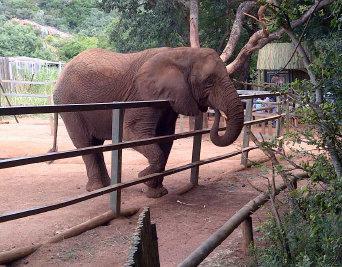 The Elephant Sanctuary has African elephants and offers an interactive elephant experience. At the sanctuary you will get to know a lot about elephants, touch them and interact personal and up close with them on this tour. A once in a lifetime experience. Get close up pictures of these giants and also have your photo taken by the highly trained and experienced staff working at the sanctuary. Started in 1999, the Elephant Sanctuary, grew from five elephants to a total of twelve African Elephants (Loxodonta Africana). These Elephants have been domesticated through positive reinforcement animal management principles, these Elephants have been domesticated and as a result, provide us with the unique opportunity to interact with them. Visitors on this tour are taken on a journey into the world of the African elephant and are guided through an unforgettable experience with these magnificent creatures. Visitors to the sanctuary will be able to feed, touch and get to know these elephant. Visitors will get the incredible opportunity to walk hand-in-trunk with the elephants. Enter the world of the Elephant with Elephant Back Riding. At an additional cost. Bare-back Elephant Back Riding enables us as humans to feel the power and bulk of an elephant in contrast with the quietness, delicateness and grace of these mammoth creatures' movement as they walk/glide across the ground. Understand the height at which an elephant stands and experience their environment from an elephant's perspective. See the stables where the elephants sleep at night. Overnight accommodation is also available at the sanctuary. Recently the Elephant Sanctuary and the Monkey Sanctuary next door has merged into one property. The Monkey Sanctuary tour takes visitors on a walk through a beautiful forest with different kinds of monkeys all around and to be seen around every corner. Some will make you laugh with their escapades. the walkways takes you up against the side of the magaliesberg mountain side and you will also experience the surrounding trees at tree top level. most of the monkeys have all been saved and are being rehabilitated. Guests can enjoy a drink on the deck that overlooks the elephant boma. Don't forget to bring your camera, sun hat and flat walking shoes on the tour. For a different perspective, guests can get the opportunity to ride on an elephant in a boma. It is not a safari experience. (Only for the fit and adventurous). Recommended to wear jeans or long pants. Riding is an optional extra which can be" added-on" to the Elephant Interaction program. Children must be 8 years+ in order to ride elephants. Please note that Elephant Back Riding is an optional extra and cannot be confirmed until the day of the program. For the safety of our guests, our Senior Handler will either approve of decline any riding on the day. Pick up and drop off from your hotel or guest house in Johannesburg, Rosebank, Sandton or Pretoria. Please advise on your hotel details. Follow us and become a part of the Deeprift Ventours community.